On a hot June afternoon, a black man set out to walk across his home state of Mississippi. He walked to confront racial fears, discrimination, and hate. He walked to make a statement. But two days into his journey, James Meredith was shot and wounded in a roadside attack. Leaders of the civil rights movement, including Martin Luther King, Jr., and Stokely Carmichael, rushed to take up his cause. What started as one man's mission became the March Against Fear. It was the first. Revolutionary change in the civil rights movement took shape during this march, and a proud rallying cry emerged: "Black power." It was the last. Never again would movement leaders rally together in such a great march for social change. It was historic. Spanning several weeks and hundreds of miles, this was the longest march ever attempted through such hostile territory, and no one knew if it would succeed. It was nearly forgotten. By many measures the March Against Fear should be considered one of the greatest protests of the civil rights era, but it received little attention. Critically acclaimed author Ann Bausum sheds light on this lesser known, yet crucial turning point in our nation's past. From June 5-26, 2016, I commemorated the 50th anniversary of the March Against Fear by posting #OTD (on this day) social media accounts of what had happened on that date in 1966. These posts on Facebook and Twitter serve as an episodic journal for the history. Tweets from this commemoration are particularly effective at putting readers in the moment, as if the history is unfolding all over again. Here's the link to my archived Twitter record. The photos take off after June 7, so be sure to keep scrolling as you step back in time and travel #OTD with the 1966 March Against Fear. Working with primary source documents: Create a manifesto. What's a manifesto? Examine the historical context for the use of this term then click this link to see an original copy of the Manifesto of the Meredith Mississippi Freedom March. Study the language of the document and consider its structure. What cause or purpose can you envision that would benefit from a manifesto? Write your own manifesto for that endeavor. • Reed, Roy. "Meredith Is Shot in Back on Walk Into Mississippi." New York Times, June 7, 1966. • Roberts, Gene. "Marchers Stage Mississippi Rally." New York Times, June 18, 1966. • Roberts, Gene. "Mississippi Police Use Gas to Rout Rights Campers." New York Times, June 24, 1966. Journalists write the first draft of history. Compare these stories to what you have learned from reading The March Against Fear. What are some of the differences between a news story and a book about the same events? Do you learn information from the news accounts that was not included in the book? Or that was included? What might have influenced the author to include or leave out this material? Do any of the news stories contradict information shared in the book? Why wouldn't they agree? Can you find these sources in the book's bibliography? Can you find examples of material from these primary source documents being incorporated into the text? (Hint: Try searching through citations for the relevant pages of the book.) Try writing an account of the March Against Fear based solely on one or more of these articles. Consider how it might help to be able to use additional sources and points of view. Debate and discourse. Review the questions presented in chapter 2 (page 26) that framed the discussion of civil rights movement leaders over the nature of the revived march. Consider the various viewpoints expressed and expand on the debate in the classroom, with students role-playing the various viewpoints. Consider the challenges of maintaining a movement that is constantly having to accommodate multiple perspectives. What are the skills that would need to be employed for a movement to adapt and stay vibrant. Call and response. Consider the chants from the March Against Fear that employed the starting question: What do you want? See page 62 of chapter 5, for example. Research other chants of protest from other protest movements. What are some of the chants in use now during protests? Try creating chants that relate to current or past causes, and practice them using the call and response format. Note that the "call" doesn't have to be a question; it can merely serve as a prompt for the response. How does it feel to take part in a chant? Are there benefits to chanting that go beyond the sharing of the actual spoken words? Take a hike. What does it feel like to hike 18 miles in one day? Or even eight miles, as participants did on the final day of the March Against Fear? Can your classroom take a hike? The walk doesn't have to be about protest or social action. Maybe it's a nature walk. Maybe it's an outing to a museum—but walk there, don't take a bus. Imagine preparing for the effort the way organizers would have done in 1966. There were no disposable bottles of water available then. Organizers depended on donations for much of their food, and ready-made food was harder to purchase. Could you make your hike under those conditions? How would you prepare? Even with modern conveniences (including better athletic shoes), test yourself on the distance. Can you walk eight miles in a day? How much would you have to believe in a cause to walk that far and more, day after day? Take a hike, walk in the shoes of these historic activists, and find out. Point/Counterpoint. Each chapter in The March Against Fear closes with a pair of historical quotations. Examine them as a group or chapter by chapter. What are the contrasts between the paired quotes? Are there any parallels in how the quotes are presented (top quote vs bottom quote)? What impact do the quotes have on you as a reader? Does that impact change when you consider them singly versus as a pair? Consider a story from current events and seek statements people have made that play off of one another in similar ways. Finally, study the pair of quotes that open and close the book. What impact do these quotes have on you in relation to the March Against Fear? What impact do they have when you consider them in the context of current events? Photo research. Conduct your own photo research about the March Against Fear using two of the archives used by the author. As a courtesy to the photographers and these archives, be sure you properly credit each image. • Bob Fitch Photography Archive. Featuring images taken during the March Against Fear by Bob Fitch as a staff photographer for the Southern Christian Leadership Conference. Curated by Stanford University Libraries. • Jim Peppler Southern Courier Photographic Collection. Featuring images taken by Jim Peppler during the March Against Fear while on assignment for the Southern Courier of Montgomery, Alabama. Curated by the Alabama Department of Archives and History. The journey of one became the objective of thousands after James Meredith was shot and wounded on the second day of his attempt to walk from Memphis to Jackson. History unfolds with the drama of current events in this portrayal of the 1966 March Against Fear. Using a wealth of archival images, the presentation shares stories from the daily progress of the ambitious effort—and its frequent pitfalls. Meet key players from the history, including Stokely Carmichael who revolutionized the civil rights movement with his introduction of the call for black power during the march. Events from yesteryear come alive with an urgency that echoes through the themes of contemporary events. What work from the 1960s remains unfinished today? Can lessons from the past provide guidance on how to shape contemporary thought and action? Is the nation still trying to complete its march against fear? Author Ann Bausum provides a context for linking history with current events in a way that offers hope and empowerment during modern times. 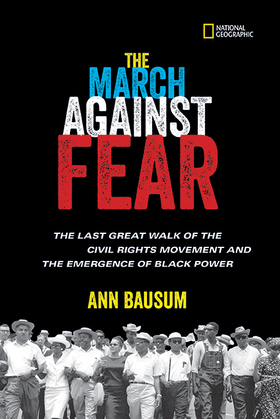 "…In addition to painstakingly chronicling the pivotal moments during the March [Against Fear], Bausum thoughtfully depicts the tensions both between [Martin Luther] King and [Stokely] Carmichael and within the movement. She offers an insightful, revealing portrait of [James] Meredith.…Bausum convincingly shows that the March Against Fear "stands as one of the greatest protests of the civil rights era" and deftly explains the many complex reasons why it was relegated to a footnote rather than a highlight in history. An exceptionally well-written and -researched chronicle of a crucial civil rights turning point." "In a powerful and timely book, Bausum (Stonewall) focuses her attention on the last great march of the civil rights era, the March Against Fear, from Memphis, Tenn., to Jackson, Miss., in June 1966. Initiated by James Meredith in an effort to make Mississippi a less fearful place for black Americans, the march…also splintered the major civil rights organizations.…Bausum dissects these internal divisions with great sensitivity.…Abundant details disclose the extent of segregation and racism, the pivotal role of law enforcement authorities, and how fraught protecting the marchers could be.…This exemplary look into civil rights history concludes with perspective and encouragement regarding ongoing struggles for social change." "An edifying and timely exposition of James Meredith and the March Against Fear and their impact on U.S. history, past and present. Bausum's clear language and smart use of archival photos and pull quotes document how Meredith's single-man walk transformed into a larger endeavor to register and unify black voters and to alleviate the fear felt by African Americans living in a racist society (a notion that would later translate to the concept of Black Power). Readers become a part of the march.…Evocative quotes from those supporting the march and those in opposition provide additional context on the sentiment felt by each side.…Bausum expertly encapsulates the overall theme of the march during a specific episode at the Philadelphia, MS, courthouse: "Dignity over anarchy. Justice over injustice. Love in answer to hate." …VERDICT A must-have volume on James Meredith, the March Against Fear, and the evolution of Black Power for high school students." "…This account [is]…written in accessible language and peppered with quotes and period photos that bring the action alive.…The brief chapters build on one another, creating a complete picture for readers with limited background knowledge. This compelling account will be equally engaging for classroom resource material or individual research." Featuring images taken during the March Against Fear by Bob Fitch as a staff photographer for the Southern Christian Leadership Conference. In 1967 President Lyndon B. Johnson established a commission to investigate the latest wave of race riots in the United States. Otto Kerner, governor of Illinois, chaired the commission. Primary source document from the March Against Fear. Featuring images taken by Jim Peppler during the March Against Fear while on assignment for the Southern Courier of Montgomery, Alabama. A ROJA Productions Film for American Experience. WGBH Educational Foundation, 2004. Transcript and related resources available online. Episode sharing history the March Against Fear from Eyes on the Prize, America's Civil Rights Movement, Volume 4. A production of Blackside, 1990, for American Experience.Transcript and related resources available online. Branch, Taylor. At Canaan's Edge: America in the King Years 1965-68. New York: Simon & Schuster, 2006. Carson, Clayborne, and David J. Garrow. The Eyes on the Prize Civil Rights Reader: Documents, Speeches, and Firsthand Accounts from the Black Freedom Struggle. New York: Penguin Books, 1991. Glaude, Eddie S. Jr. Democracy in Black: How Race Still Enslaves the American Soul. New York: Crown Publishers, 2016. Goudsouzian, Aram. Down to the Crossroads: Civil Rights, Black Power, and the Meredith March Against Fear. New York: Farrar, Straus and Giroux, 2014. Hampton, Henry and Steve Fayer and Sarah Flynn. Voices of Freedom: An Oral History of the Civil Rights Movement from the 1950s Through the 1980s. New York: Bantam, 1991. Joseph, Peniel E. Stokely: A Life. New York: Basic Civitas, Perseus Books Group, 2014. King, Jr., Martin Luther. Where Do We Go from Here: Chaos or Community? Boston: Beacon Press, 1968. Lester, Julius. Look Out, Whitey! Black Power's Gon' Get your Mama! New York: Dial Press, 1968. Reed, Roy and Hank Klibanoff. The Race Beat: The Press, the Civil Rights Struggle, and the Awakening of a Nation. New York: Alfred A. Knopf, 2006. Seeger, Pete and Bob Reiser. Everybody Says Freedom: A History of the Civil Rights Movement in Songs and Pictures. New York: W. W. Norton & Company, 1989.